Thomas Lucas didn’t live in a shoe but he had a lot of children, 16 in fact, possibly 17. He was born April 27, 1814, in Liberty Township, Clinton County, Ohio, to James Lucas and Hannah Bowman. He came to central Illinois with the rest of the Abraham Lucas clan – Abraham was his grandfather – and members of their Baptist Church from Greene County, Ohio, in the later 1820s. Within a short time after their arrival, James Lucas died. John Lucas and John Turner, uncles, were named guardians of Thomas, age 13. John Lucas was married Hannah Bowman’s sister Mary. John Turner was married to James Lucas’ sister Sarah. On June 10, 1834, Thomas married one of John and Sarah Bowman Turner’s granddaughters, Mary Turner, a sister of the infamous Spencer Turner. Thomas and Sarah had 10 children. There is a long-held story that their first daughter was named Minerva. She apparently was born before they were married and she died. I have found no evidence of this child. 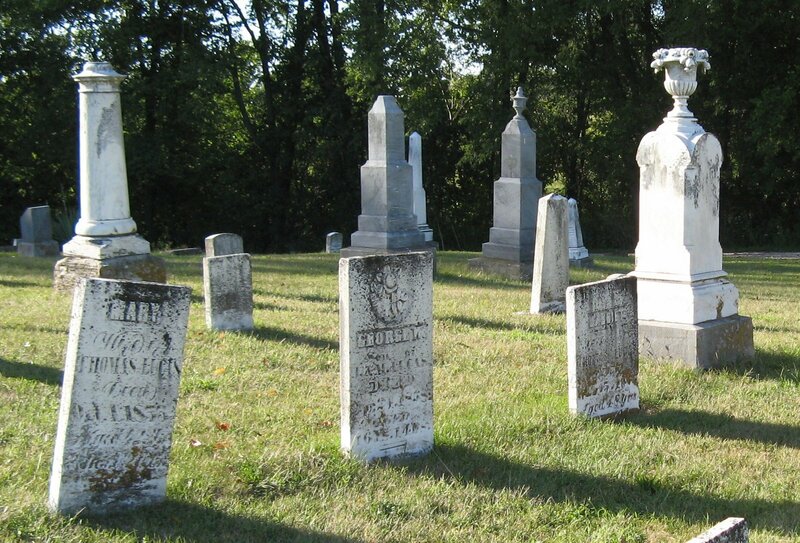 Mary Turner Lucas died on October 4, 1855, leaving seven living children. Two months later their two oldest daughters married. Thomas was left with an adult son, a not so healthy teenage son who did not survive his mother long, a 9 year old son and two young daughters. On May 1, 1856, less than seven months after the death of his wife, Thomas Lucas married Harriet Gambrel, widow of John Lanham. She was 38 and had no children of her own. However, she added two daughters to the Thomas Lucas family before she died on January 5, 1867. By then there were two of Mary’s daughters and two of Harriet’s daughters at home but one of Mary’s daughters married in April of that year. Thomas was down to three minor children. On July 10, 1867, six months after the death of his second wife and on the 33rd anniversary of his first marriage, Thomas Lucas married Charlotte Bowman, the widow of Jacob East and a relative of Thomas’ mother. She was also the sister of the soon to be husband of her new stepdaughter Arminda Lucas. Probably it was Thomas’ marriage to Charlotte that introduced the young couple. We know Charlotte had three children by her first marriage but not what happened to them. It does not appear they survived infancy. Thomas had three children at home and soon he and Charlotte had more, four more to be exact. Thomas’ last child was born posthumously and only lived about six weeks. Thomas Lucas was buried at Lake Bank Cemetery with two of his wives, several children and, later, other children and grandchildren. Letters of Administration issued to Allen Lucas, eldest son, on August 22, 1874, same date as his Petition. The estate contained 918 acres of land. The widow received $234.88. The surviving children or their heirs each received $46.97. Sometime after 1880 Charlotte and her surviving children moved to Oxford, Kansas, where there were other Lucases and Bowmans as well as others who had left central Illinois for the promise of land in Kansas. She did not remarry but is not buried in Lake Bank.